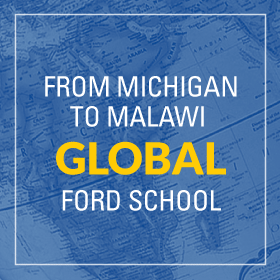 One of the U-M's major Peace Corps anniversary events will be a national symposium on the future of international service. Panelists: Alan Deardorff , Gerald R. Ford School of Public Policy and Department of Economics, University of Michigan Susan M. Collins , Joan and Sanford Weill Dean of Public Policy, University of Michigan Mark B. Padilla , School of Public Health, University of Michigan Susan Waltz , Gerald R. Ford School of Public Policy, University of Michigan Co-sponsored with the International Policy Student Association and the International Policy Center. Over 40 alumni and friends joined Susan M. Collins, Joan and Sanford Weill Dean of Public Policy, in New York City for a Ford School alumni reception. Dean Collins and Susan E. McLaughlin (MPP '93, Senior Vice President at the Federal Reserve Bank of NY) kicked off the event with a presentation about the current financial crisis. Following the presentation and a lively question and answer session, guests reconnected and networked while enjoying refreshments at the Midtown Executive Club. Thank you to all who came to APPAM Conference reception in DC, it was great to see so many people! 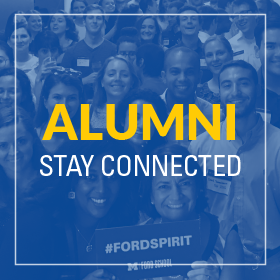 Nearly 80 alums attended representing all three programs of study – BA, MPP/MPA, and PhD. Click through the slideshow below to see some photos from the event. Thursday, November 5, 2009 6:30-8:00 p.m. Hors d\'oeuvres and cash bar Join Susan M.